2 years ago at Euro FOO 2006 who commented that climate change would be much easier to deal with if we could see carbon dioxide. The second was with Claus Dahl who observed that Second Life is a great platform to prototype large scale augmented reality applications as every object in Second Life has an Id and you can give away free augmented reality glasses in the form of heads up displays (HUDs). A year later I started to experiment with the latter idea with SLateIt, an augmented reality application that can be used to find, tag and rate virtual objects in Second Life. Although I think tagging, rating and recommendation systems have a bright future in navigating the vast quantities of people, places and stuff in Second Life, SLateIt mostly came about as a way to demo augmented virtual reality in Second Life without a large data set to associate with objects in SL. Finally, last week, the awesome team of Max Williams, Ryan Alexander, Andrew Conway, Simon Willison, Natalie Downe and Chris Waigl helped me bring the two ideas together by mashing up SLateIt, SecondLife and Gavin Starks’ new AMEE emissions data base to create Carbon Goggles. Instead of mapping Second Life object Ids to tags and ratings, Carbon Goggles maps Second Life object Ids to AMEE URLs. The HUD queries carbongoggles.org for emissions data for nearby objects and, if found, overlays a sphere on the object with a volume corresponding to the monthly carbon emissions of the object. In 24 hours we managed to hack together a working system to demo at Mashed and 2 days later added an annotation interface that allows new objects to be annotated with emissions data. Carbon Goggles has had some great coverage over the last week, but I really hope the story doesn’t end there. The goal is to annotate objects across Second Life to produce a collaborative user generated ambient augmented virtual reality scientific visualisation the size of Denmark. 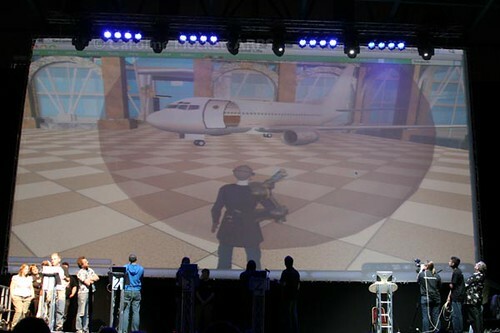 Together we can add an extra layer of information to Second Life allowing people to learn to make more informed decisions in real life while living their Second Life. If you’re part of a group in Second Life that would like to help annotate objects, host Carbon Goggles vendors in world, create videos or images of Carbon Goggles visualisations or would like to help in any other way, please join the Carbon Goggles group in Second Life and get in touch.